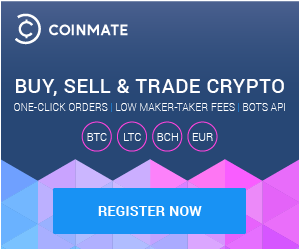 It is advised not to use the same password for important servers, so we hope your Coinmate password is unique. A strong password is at least 8 characters long and contains both lowercase and uppercase characters, numbers, and special symbols like comas, etc. It may seem as pretty obvious, but you’d wonder how many users on the net does not implement these basics in their routine. It is good to work with the best, right? Regarding email servers, it is highly recommended to use those, that implement highest security standards rendering your mailbox out of reach to hackers. Generally, we can recommend Gmail as one of the most popular ones, if you want to go one step further in terms of anonymity, Protonmail is a great provider. Both are free of charge and very reliable ones. Choosing a weakly protected email address could result in its overtaking by a hacker, which can then reset the password on sites attached to the email, please be very careful about such possible vulnerability. What applies to your email password, also applies to Coinmate. It should be a unique, long and complicated one. But for the eventuality of anyone breaking in, you can set-up an extra security measure. In account settings – Security menu, you can find and activate Google 2FA authenticator that secures your withdrawals. With that in place, it is almost impossible to steal your funds even if the attacker gets access to your email box or Coinmate account. These are the basics of course, there is a lot of other ways you can stay safer on the internet nowadays. But taking just these few hints in consideration is the minimum to keep your money safe on Coinmate. And of course, we are always on the watch on our side.